Join the BC Civil Liberties Association for the Canada 150 Fireworks! 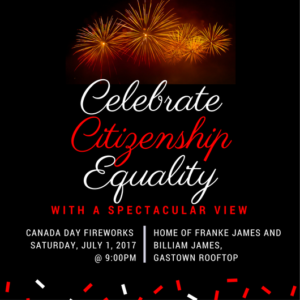 Celebrate the BCCLA’s work to restore citizenship equality with a spectacular view— from the Gastown rooftop patio of our hosts artist Franke James and Billiam James! The party starts at 9:00pm and goes until after the fireworks display. We’ll have drinks, a champagne toast, and festive snacks! This party celebrates three years of work fighting to repeal the changes made by Bill C-24, and restore citizenship equality for every Canadian, regardless of where they or their families were born. After three years and one hundred and twenty-seven days of work, we’ve defeated the second-class citizenship bill! On Thursday, June 15, 2017 the House of Commons passed Bill C-6 which repeals many of the worst provisions of Bill C-24, including the provision that allowed for citizenship-stripping of dual citizens. Not only that, but the House passed it with a critical amendment restoring the right to a fair hearing for people at risk of losing their citizenship under allegations of misrepresentation. Together, these are extraordinary victories for citizenship equality and due process. If you believe that every Canadian should have the same citizenship rights regardless of where they or their families were born, then what better way to celebrate Canada Day than with us and the best view in town!